The firm of Clement Talbot was founded in 1903, bringing together the motor engineering expertise of Frenchman Adolphe Clement and the money and social standing of British aristocrat the Earl of Shrewsbury and Talbot. Cars were manufactured at a purpose built factory at Barlby Road, Kensington, London and sold as Talbots, incorporating the Earl’s coat of arms in the badge. Competition was in their blood from the start. Clement competed in the world’s first ever Grand Prix at Le Mans in 1906. The English Talbots earned their nickname “Invincible” in the years before WW1 when they won consistently on the hills, beaches and tracks of Britain. Their finest hour came in February 1913 when Percy Lambert thundered round the Brooklands track on a 25hp Talbot to become the first man in the world to cover 100 miles in one hour. 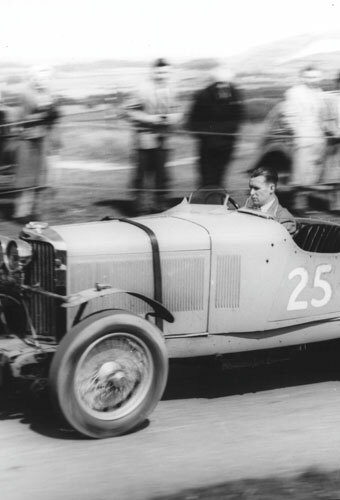 In the early 1930’s the Talbot 90’s and 105’s, designed by gifted Chief Engineer, Georges Roesch, achieved great success at Le Mans and, when not going flat out on the tracks, the Talbot 105’s triumphed in the Alpine Trial, in 1932 winning outright without the loss of a single mark; an extraordinary performance. There were numerous other competition successes in the 1920’s and 30’s. The Talbot Owners’ Club (TOC) was established with support from Clement Talbot Ltd in 1934, prior to Rootes buying Talbot. Early membership numbered some 300 and included luminaries from the Talbot company and racing fraternity. The Club catered for all cars made in the Barlby Road factory and, in the late 1930’s, became the Sunbeam Talbot Owners’ Club, but ceased to function during WW2. The Sunbeam Talbot Darracq Register provided a home for Talbot owners until the Talbot Owners’ Club was re-formed in 2003 under the driving force of John Young. The TOC is wholly aligned with the aims of the founders back in 1934; “instituted for the fuller enjoyment of Talbot ownership”. Talbot is the only successful car marque founded by a peer of the realm and the Club is proud to have as its Honorary president the founder’s great grandson, the Earl of Shrewsbury and Talbot. The founder’s emblem, a standing lion upon a cap of maintenance beneath a peer’s coronet, is on the radiator of every Talbot. The essence of the Club is to ensure that members meet and enjoy themselves; the Club is open and democratic, dialogue is encouraged. It is for people of all ages who like Talbot cars and want to enjoy the company of like-minded people and also to support current Talbot involvement in historic competition. The TOC offers members a wide range of attractive benefits including an informative website and active forum; a bi-monthly magazine covering Talbot news and reports, competition activity, technical articles and period extracts from pre-war publications; access to spares; a spread of local, national and international events; an enjoyable AGM weekend and a Christmas lunch. The Club also has an enviable archive collection including a number of important donations. The TOC car badges, designed by Georges Roesch are very high quality and individually numbered.